Although it might not be in the news as much, the Syrian refugee crisis is still ongoing and thousands of people still need help. I have a friend who decided to do something about it and recently went to the Greek island of Samos to help. He asked for donations before he left and managed to raise a staggering £6,000. However, when he got there, he discovered that the situation is still very much a crisis. His words say it better than mine so you can read his two messages below. The Greek economy as it is, the police don’t have stationary to fill out forms to process refugees, so they stay in camps waiting to be processed. If they don’t have stationary, they definitely don’t have the money for everything else they need. The crisis is being handled by volunteers and the local community, who would hugely benefit from our help. If you want to donate anything, please contact me. Money is probably the simplest and easiest thing to donate, but shoes are also needed. Read on below if you want more inspiration. You may have noticed that the refugee crisis is not mentioned in the mainstream press much any more – at least in relation to the suffering of the refugees. But it seems that the situation is as terrible as ever, if not worse with the rain and cold of winter. Jennifer and I are members of various volunteer groups and get daily reports from volunteers throughout Europe who are doing what they can to help. We are so shocked by what they report. So, I am going over to Samos, a Greek island, on Saturday 14th November for a week to try and help in whatever way I can. The Greek islands are often where refugees first arrive in Europe on dinghies and wooden boats. Conditions sound horrendous, the islands are completely overwhelmed and reports are that they are desperate for volunteers. For whatever reason big aid agencies seem to be few and far between. Last week three boats capsized off one of the islands with over a hundred people mainly children drowning. It was locals, individual volunteers, and volunteer life rescue teams trying to help. It’s also locals and individual volunteers handing out donated clothing and blankets that they’ve shipped over themselves, helping keep the camps as clean as possible, handing out food, trying to help families find missing members, and transporting refugees to hospital, administering first aid, and picking up refugees from remote beaches. Lesvos, an island with a population of around 90,000, had 125,000 refugees arrive on its shores in October and Samos with a population of 30,000 receives often up to 1,000 refugees a day. They are sleeping outside in the cold often with wet clothes from the boat journey over and without blankets. Babies are cold and hungry (seems even more awful to me now I have Evan). Last week there were only 5 volunteers dealing with over 5000 refugees sleeping at the port in Samos. These people are running from death in their countries, facing death on their boat journeys and then facing appalling life conditions when they arrive at what is just the first stage in their journey through Europe. We deliberated and checked with a number of people about whether it was sensible to spend money on flights for me to go just for a week rather than just sending them that money but every single response was, we need help on the ground now, we are overwhelmed. The volunteers are doing up to 20 hour days. I am taking two suitcases of baby food and nappies and my plan is to take as much money as I can so that when I get there I can buy whatever is most needed. I hope that this is the best way to deliver the appropriate aid and also support the local economy. I imagine I will buy as many blankets as I can or as much food as I can. One volunteer told me that a local lady on Samos with 4 children is cooking 400 meals a day for the refugees. Apparently €1000 is enough to make 10,000 portions of healthy rice/pasta dishes. And last night 40 people (10 children; three under 1) arrived on a dinghy, completely soaking. There were no blankets except for 3 one volunteer had in her suitcase. It’s that desperate. I have set up a fundraising page here and would be so grateful if you would make a donation. I promise your donation will GO DIRECT TO HELPING. We have paid for my flights and accommodation etc – no donated money will go towards that. I can let everyone know exactly what the money is spent on. I’d also be really grateful if you would share this email with anyone you know who you think might be willing to donate. That’s me returned from an incredible, inspiring but often heartbreaking trip to Samos. Thank you so much for your incredibly generous donations, because of you we have managed to raise a mind blowing amount of money, currently standing at almost £6000. This is well over 10 times what I had hoped to raise so I cannot express how grateful I am. With this huge amount of money comes a responsibility to spend it wisely so please be assured that we put a lot of thought into what we spent the money on. I’ve listed this below. I thought I’d also give a brief description of what I did out there for those who are interested. I can send more info to anyone who wants it. Samos is a gorgeous, quite mountainous and green island. It is slightly cheaper for the refugees to get to than some of the other islands because despite its closest point being only 2.5 miles from Turkey the route the refugees take is 11.5 miles at its shortest due to a Turkish military zone. After a journey of between 3 to 12 hours (depending on the wind direction) they normally land on a rocky outcrop and then need to climb a 640m rocky hill with 60m cliffs (often in the dark) when they arrive on shore. When people arrive they’re still not sure where they are though – someone in the boat/dinghy is given a discount to steer and they set off from Turkey not really knowing where they’re going. They usually head for the nearest land point hoping it’s part of Europe. When they arrive they are always desperate for someone to confirm where they are. The moment I arrived on Samos and contacted the local woman who coordinates the volunteers, the suitcase of blankets I took with me were put straight to use – there had been an emergency situation and she was dealing with a group of new arrivals who were freezing and soaked to the bone. I spent my week giving out tea and biscuits, sorting the emergency store at the port, doing clothes and shoe drop offs, walking round the camp at night handing out blankets, driving people and aid around the island, cleaning the camp when people left ready for the next arrivals, helping at each ferry departure and generally doing whatever I could to be useful. Handing out clothes and shoes was hard – particularly the shoes. We always ran out. We would have children coming up in bare feet and we had to turn some of them away as we didn’t have any shoes to give them, truly heartbreaking. And we always always ran out of men’s shoes sizes 7, 8, 9 (40, 41, 42). I think I’m going to be dreaming the number 42 for the next year or so. We had so few shoes of that size but we needed so many. So many of the refugees had shoes falling off their feet and I saw men walking on their toes with sandals that must have been 3/4 sizes too small (we’re now doing a shoe collection – pls see below). I also found the ferry departures particularly emotional. You would see up to 1000 refugees all sat in a line waiting to board. If any of them stood up they were shouted at by the army. I was having to hold back tears watching the refugees being herded onto the ferry like cattle with so few possessions. Most only had medium sized rucksacks… that is all they have in the world. I also visited the camp inland where non-Syrian refugees were kept. Only a couple of NGO’s were allowed in that camp and photos were forbidden. From what I saw from outside it looked pretty grim and it had two sets of barbed wire round the whole camp with the gates being locked at night. There were about 500 refugees there when I saw it but there has been occasions when there have been more than 1000… it’s designed for 240. There were positives too though. The local Greek people are amazing and doing so much. The woman in charge of the volunteers has a full-time job but devotes every other minute to helping. She hasn’t been home before midnight in 4 months. And I think I’d already mentioned the woman with 4 children who cooks 500 meals a day. They are trying to create a lovely welcoming community atmosphere at the port and have managed to get all the volunteers, NGOs and Police to work together and not just stick to their own agendas which is amazing and supposedly very rare. They will soon have their sheltered (portocabins and large marquee) accommodation close to a 1000. 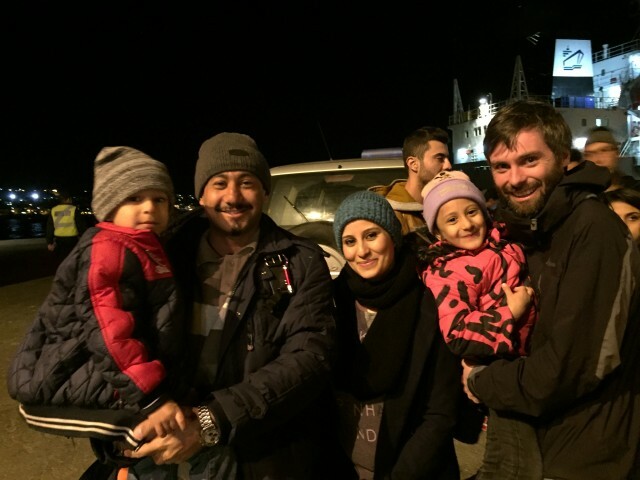 The refugees I spoke to were so lovely and I couldn’t believe how they managed to smile so much. When they told you stories about where they’d come from and family they’d lost or left behind they had a very distant look on their face that broke my heart. On one of the days we arranged a basketball training session for a Syrian international player… I have never seen such a large smile on someone face. He stood for 5 minutes just listening to sound of the bouncing ball… that was special. I also witnessed a week of good weather, which helped. When it rains it is much worse as a lot are still sleeping outside. £3000 to Samos Divers – These are incredible volunteers who have the only rescue boat that can get close to the rocky coast of the island of Samos. They are made up of policemen, firemen and hoteliers; the policemen and firemen are sometimes out on the boat rescuing at night then the following morning searching the hills of Samos for refugees who have got lost after landing on land. They rely on donations and currently use old summer wetsuits and basic scuba equipment for their missions. Our donation along with one other donor has allowed them to receive incredible new equipment that will without question help them save more lives. The equipment includes 9 dry suits, 6 full-face masks with breathing apparatus and 6 communications equipment which will now give them radio contact with the spotter on the boat. Please watch this news clip about the Samos Divers. It describes better than I could what an amazing a job they do. I met Alexandros who is interviewed in the clip before deciding to hand over this large donation. Another amazing outcome of this donation is Alexandros and his team will now have the equipment that means they can train other divers across Greece to become search and rescue divers – the aim would be that they would then be able to have similarly trained volunteers on other islands like Lesbos, Kos and Leros. £1000 on medical equipment – through my trip we have met an incredible team of volunteers who work on the border of Syria and Turkey in refugee camps and small border towns where refugees are basically squatting. They also work in Syria itself in areas where big aid agencies won’t go. They are amazing. The £1000 was spent on one oxygen tank and 10 bone fixators – they advised that these were in desperate need. £500 – on food for the refugee families on the border of Turkey and Syria. The organization mentioned above has sourced bulk packets of food in Turkey and can feed a family for a week for £10, so your donation will be used to feed 50 families for a week. I was originally going to give the money to the woman in Samos who makes the food for the refugees but someone else from the UK provided a big donation when I was there so I thought this was a better use of the money. £365 on supplies –sleeping bags, emergency blankets, hats & gloves, medicine. I was also kindly donated snoods, socks, torches and flasks by Craigdon sports before leaving. £330 on van and fuel – This was invaluable, I rented a big 9 seater people carrier that still had massive boot behind the seats. Every day it was rammed full of donations to be taken from the warehouse to the port and also transporting volunteers to where they were needed around town. £250 on stationery for Samos Police – The Samos police are working tirelessly under stressful conditions for £600 a month yet because of Greece’s own financial crisis police are having to supply their own stationery. This is slowing up the processing of the refugees which means they are having to stay longer in camps on Samos. The police have recently received donations of some new computers (they are using 10 year old computers at the moment) and we have provided 2/3months worth of stationery. This will all help speed up the process of the refugee registration and reduce backlog in the camps. I hope you all think this was a good use of your amazingly generous donations. SHOES, SHOES and MORE SHOES – The refugees need shoes. Currently on Samos they are screaming out for donations of shoes but in particular mens sized 41, 42 & 43 (7, 8 & 9). We are trying to collect as many of these sizes of shoes as we can and will arrange for them to be shipped over. So let us know if you have any! Only decent quality that people can walk on long journeys with please. BABY INCUBATOR – a baby incubator is needed desperately by the medical team in Syria. They need to raise another £2,125 to be able to buy one. The remaining money and any additional donations we receive now I’m back will go towards this and shoes. I’ve attached one photo of me and an amazing Iraqi family I fell in love with (EDIT: Shown above). They’re trying to get to Sweden. They tried to apply for a visa with a bogus agency in Turkey who stole their money and passports. The other photo is of a group of great guys from Aleppo, Syria who were a massive help around the port with translation and our tasks. Thanks again everyone. You’ve helped so much. 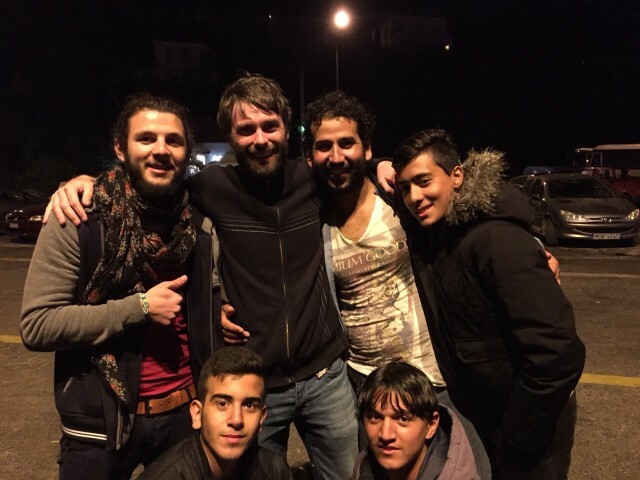 And not just in terms of money given – every refugee I spoke to expressed such joy at knowing people cared about them.